Discovered by Bedouin shepherds in 1947, the Dead Sea Scrolls are of incredible significance for both scholars and those from the Jewish and Christian communities. Found in Qumran on the north-western shore of the Dead Sea they continue to spark debate. 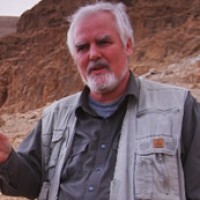 To hear the background to this historic find, Paul Calvert spoke with Stephen Pfann, an archaeologist from the University of the Holy Land in Jerusalem. Paul: Where and when were they found? Stephen: The Dead Sea Scrolls that we think of today were found between 1947 and 1956. That's when the vast majority that the 11 caves contained - close to 1,000 manuscripts - were found. Back in the 9th Century there was a find by a shepherd and there were a bunch of scrolls found in a cave and they were brought up to Jerusalem. Back in the 2nd Century/early 3rd Century a jar was found with a Psalm scroll inside of it in Greek. There have been discoveries for many centuries. Those are only the recorded discoveries. There was much more out there. What's interesting about the 1,000 scrolls that we have in our hands is that there are nearly 1,000 scribes that are represented there. Imagine each scribe writing at least 50 manuscripts in a lifetime, so how many more manuscripts that there originally were. This is a major find. To have so many of these manuscripts represented where we can tell even by the smallest fragment the character of the scrolls; in some cases nearly complete scrolls; there's probably only about seven of those that we would unroll and say this is close to complete and they may be between 75% and 99% preserved. Most of the scrolls that we have are very fragmentary, less than 3% and some of them are just a small fragment that may be a square inch in size and that is considered one scroll because it represents a fragment of what was originally a complete scroll. We do have many scrolls that are in tact and we have them in various languages and of course the content varies considerably. When we are talking about these particular scrolls, which come from Qumran, we're looking at primarily literary documents. There were very few personal documents. There are other caves in the Judean wilderness, all the way from Samaria and Jericho in the north down to Masada in the south where hundreds of manuscripts were found that were more business and personal deeds and contracts, letters and things like this. They tell more about individuals and daily life, so there is more out there that we aren't usually taking into account when we talk about the Dead Sea Scrolls. Paul: It's quite an interesting story, how the scrolls were found by a shepherd boy. What was the story? Stephen: A shepherd was just wandering with his sheep and according to the story that was told, he threw a rock at a sheep and it went into a hole. When he saw that hole, which is only about one and a half square foot in size, he went and threw another rock inside, to discover if there was something interesting in there, (in his mind perhaps treasure). When he threw it in, he heard the stone bounce off some pottery and realising that he may be on to real treasure, he had to go back to his brother and friends and tell them about this story. He brought his brother and a friend back, (I think a cousin), who would stand outside the cave. His brother and he went inside and found many jars. Only one jar had anything inside of it, which were some seven scrolls. They didn't even think about what was on the ground. There were another 70 scrolls or so that were fragmentary on the ground itself. There were linen fragments and other things in the cave as well as up to 50 jars complete and broken on the floor of the cave. They probably broke a few themselves and they were very disappointed that there was no treasure and only these letter pieces and so they brought these scrolls back to the tent with them. They brought a couple of jars as well and unrolled the largest scroll from one end of the tent to the other, which happened to be the great Isaiah scroll, which we're so familiar with. They brought it into Bethlehem to a person who was an antiquities dealer; more like a pilgrimage shop I suppose as they did some leather repair on the side. For whatever purposes he tried to come up with enough money to buy these scrolls. He paid for the scrolls and then sold them for a very small amount. Paul: Do we know how much he paid for them? Stephen: It was probably just a handful of Jordanian Dinars. They didn't know what they had and the dealer didn't know exactly what he had either, but he knew they had writing on them and he thought maybe the head of his church would be very interested, so he had these brought to Jerusalem. He showed them to his Pastor who was the Metropolitan of the Syrian Orthodox Church at the time. The church ended up buying the seven scrolls and they proclaimed that these were probably ancient Syriac, but the fact is when it was brought to the École biblique and brought to the librarian there and then showed to another scholar they thought at least the ones that they were shown that they were probably forgeries. They looked too nice and the lettering didn't look quite right to them and so they walked away disappointed; but it couldn't be a forgery because it was found in a cave. After that they went to the All Bright Institute and the Director was away, but a man by the name of John Trayver was there. He was a student of W F Albright at John Hopkins University, but was taking pictures of the flora of the land at the time, so he had the equipment there to take some photos and send them back. In the United States, when the discovery was made a little bit later than the discovery as it was found by the professor at the Hebrew University, they both simultaneously were able to proclaim with W F Albright that these were indeed genuine and very ancient manuscripts probably going back to as early as the 2nd Century BC and so that was a tremendous discovery. Three of the scrolls, the less preserved ones, were sold to a Hebrew University and those scrolls were sold or acquired on the eve of the proclamation of the State of Israel. Paul: What languages are they written in? Stephen: Altogether 11 caves were discovered up to 1956. On average about one tenth to one fifth of the scrolls are written in Aramaic, but most of them are written in Hebrew and with only about 1% written in Greek. Nearly everything in the area of Qumran was written on parchment, maybe about 10% written on papyrus, but most of it on parchment, which would have been more like goats skin or sheep's skin. They were hidden in these caves in the cliffs as people escaped for their lives, hoping to return to retrieve them someday, but obviously were unable to do so, which left them in the caves all these centuries. It was not just one event, but a number of events that we are speaking of in terms of the hiding of the scrolls in caves; it represents maybe less than half of the caves that were found in Qumran. That's caves one, two, three, six and 11 were actually found in the cliffs and were coherent libraries from different people. You wouldn't want to go 1km north like in caves two and one in order to look for and retrieve a scroll, but it would have been kept on shelves and we do believe we have the actual area in which these were stored; there are library shelves. We do have the slots where these scrolls were once on the shelves of the library, at least from cave one and perhaps cave six. 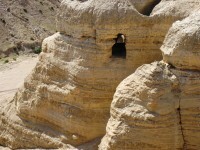 The other scroll caves, two, three and 11, which are in the cliffs, may have come from people running for other reasons, like the destruction of Jerusalem, in order to hide these as they were going down the Jordan Valley to meet their deaths. We have the story that the Zealot leader who took them down to the Jordan valley, 3,000 of them were massacred by the Romans as they tried to escape, but they left many things in the Judean desert as they were escaping for their lives. There's a great story to be told in every cave and each story has its own set of scrolls that are found there with its own witness to the lives of these people. Paul Calvert is from Carlisle in Cumbria working as a Journalist in Jerusalem and Bethlehem. He is also a radio presenter with a documentary show. I had the pleasure of staying with Stephen and Claire Pfann in Jerusalem on two different occasions and enjoying his family. He took it upon himself to be our own personal "tour guide", and with his vast knowledge of archaeology and flora of the area, it was an amazing experience. I had never met a nicer family with a desire for true knowledge! What a blessing they are!